Ivanka Trump makes Donald even scarier. She is gracious, capable, and not crazy. What is she doing helping her father? Donald Trump with Ivanka Trump in Scotland, July 30, 2015. 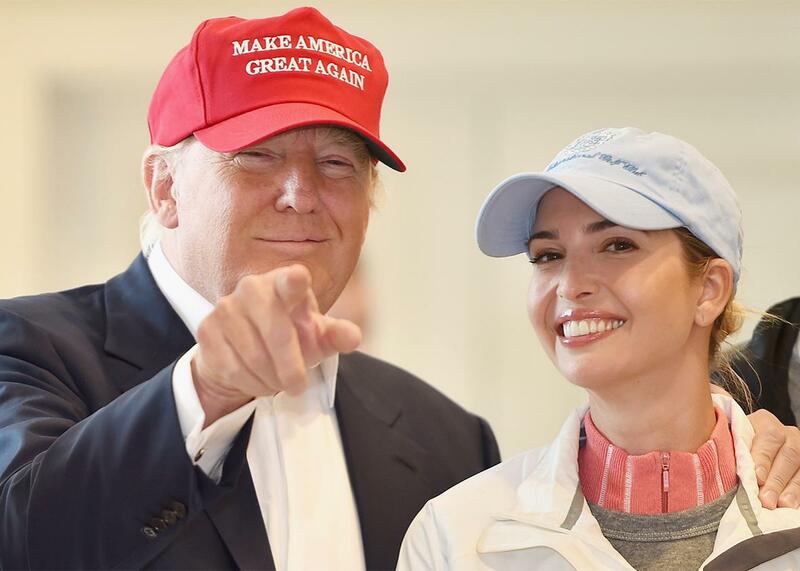 Ivanka Trump achieved her status as the best reality television character the genre has ever produced on her father’s NBC program Celebrity Apprentice. This was an arena in which the likes of Tom Green, Dennis Rodman, Andrew “Dice” Clay, and other reanimated wax figures from the Museum of Déjà Vu would vie to create a winning entry for the Schwan Food Company’s LiveSmart frozen food line or the catchiest jingle for Chicken of the Sea, and where Melissa Rivers might be spotted screaming “Whore pit vipers!” at her fellow female contestants. And there would be Ivanka, as grave, groomed, and expertly briefed as a dignitary at a disaster site, checking in on how a team’s dog food commercial was coming along or gently arbitrating a screaming match between Lisa Lampanelli and Lou Ferrigno or smiling gamely as a shirtsleeved Piers Morgan tried to flirt with her. No matter how grisly the post-celebrity carnage at her feet, Ivanka radiated warmth and star wattage—but her charisma was a protective force field, not a beckoning flame. She evinced a holographic ability to be in her surroundings but not of them, fully possessed of her poise and glamour even when forced to dress down Gene Simmons, her throaty boarding-school voice and diction in service of a gleaming mental apparatus that never misfired. Imagine watching old WrestleMania footage and suddenly realizing that “Rowdy” Roddy Piper’s corner man was Jacqueline Kennedy. That’s kind of what it was like to watch Ivanka on Celebrity Apprentice. And it’s kind of what it’s like to rewatch her introductory speech from when her father formally announced his presidential candidacy at Trump Tower in New York City on June 16, 2015. “My father is the opposite of politically correct,” declares the Wharton graduate, executive vice president of development and acquisitions at the Trump Organization, and head of the Ivanka Trump lifestyle brand. “He says what he means, and he means what he says.” A practiced giggle laps at her delivery; in the upper balcony, a rabid fan lets rip a “YEEAAAHH!” Ivanka gazes up placidly and drops a barely murmured “Thank you,” much as she would drop a linen towel into a washroom attendant’s basket. That “Thank you” is amazing. It is the verbal equivalent of the hologram starting to flicker and fade out. However much her father’s campaign might frighten you—for the blunt-force racism and nativism of his electoral appeals, for his ghastly misogyny, for the escalating violence he has encouraged at his rallies, and for the terrifying strain of white-supremacist resentment he has activated in his constituents—the fact that Ivanka is beside him through it all makes it one degree more frightening. Against every prevailing trend among the adult children of obscenely rich narcissists, Ivanka and her brothers Don and Eric seem to have emerged from the Trump family’s gold-plated crucible—and from their parents’ spectacular 1990 divorce—as thoughtful, level-headed, and hard-working people. In Born Rich, Jamie Johnson’s documentary about variously sad and gross scions of bazillionaire families, wry and merry Ivanka is cast as the Normal. 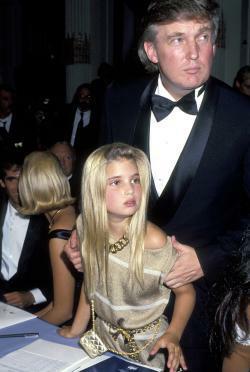 Jonathan Van Meter, author of a scathing 1989 Spy takedown of her mother, Ivana Trump, referred to Ivanka and her brothers in a 2004 New York family profile as the “Trump parenting miracle.” But there is one piece of evidence that casts this miracle into doubt: the affection and loyalty that all three children demonstrate toward their horrific father. Far into her last trimester of pregnancy (she is married to fellow real estate scion Jared Kushner; their third child is due any day), Ivanka stumped for her father everywhere from Iowa to New Hampshire to South Carolina. At the Republican debates, she is often the person he huddles with. He is her “great mentor,” Ivanka says, and she is his “character witness,” as Cosmopolitan put it, invoking her top-tier position in the Trump Organization as proof of her father’s commitment to gender equity. She is “his unofficial campaign spouse,” per the New York Times. Donald Trump and Ivanka Trump during a 1991 event at the Plaza Hotel in New York City. The Times’ formulation is as apt as it is uncomfortable. Ivanka was seated beside her father in 2006 when he told The View, “She has a very nice figure. I’ve said that if Ivanka weren’t my daughter, perhaps I’d be dating her.” (He liked this quip so much that he effectively repeated it to Rolling Stone last year.) Of course, Ivanka, then 24, laughed it off on The View, making sly eye contact with her hosts as if to say, Would ya get a load of this old lunk? As it turns out, this exchange foreshadowed a key dynamic of the 2016 election season. Because the Trump campaign derives so much of its energy from schoolyard taunts—about Carly Fiorina’s face, Marco Rubio’s height, Megyn Kelly’s menstrual cycle—the most important quality in Trump World is to be in on the joke, no matter how grotesque and insulting the joke might be. An entire decade ago, Ivanka was showing us how. We’re all working really hard at architecting the lives that we want to live and lives that are consistent with our personal priorities. And I do think there is this unfortunate prevailing depiction of the working woman as wearing a black pantsuit and being solely focused on her professional role and that’s just not true and hopefully I can be a small part of changing the narrative around what it looks like to be a woman who works. 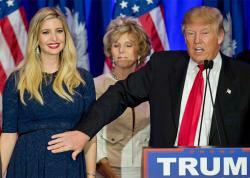 Donald Trump pats his expecting daughter Ivanka Trump while celebrating victory in the South Carolina primary in Spartanburg, Feb. 20, 2016. According to three sources close to the campaign, Ivanka was troubled by her father’s comments that Mexican immigrants were rapists. “She’s close to her father and is sensible enough to know a problematic situation,” a friend of Ivanka’s told me. … At one point, according to two sources with knowledge of the matter, Ivanka submitted several drafts of a statement … to walk back the quotes, but he refused to have them published. It’s not impossible that Ivanka will continue to embrace her family’s name and capitalize on its resources while somehow maintaining a firewall of genteel graciousness between her own brand of Trump style and her father’s coerced-wet-T-shirt-contest-at-the-neo-Nazi-roadhouse brand of Trump style. But her complicity in her father’s crusade, like so much else about the Trump campaign, has gone from merely embarrassing to outright alarming—not least because nobody understands better than Ivanka Trump how well her father bears up amid bloodthirsty mayhem. In Playing the Trump Card, she recalls the ill-fated 1988 heavyweight boxing championship in Atlantic City, where 6-year-old Ivanka and her family had ringside seats to watch Mike Tyson knock out Michael Spinks in just 91 seconds. “The place went crazy. Not in a good way,” she writes. “It felt for a few tense moments as if a riot were about to break out. … People started yelling that the fight was fixed and demanding their money back.” Amid this bedlam, she recalls, her father had the presence of mind to enter the ring and speak calming words to the crowd. “I remember thinking he was so brave, so confident, so charismatic, trying to take control like that,” Ivanka writes. “I imagine it was a scary scene, but it never occurred to me to feel afraid because my father was there, taking charge and doing his best to give the audience what they wanted.” Now, nearly 30 years later, her father is still there, giving the audience what they want, and one wonders if it ever occurs to her to feel afraid.